The historic Fox Pool produced a double, a 20, a 30 and a 40 in the same session for Phil Kingsbury. Fishing for two nights on the three-acre lake, which is part of the Longfield Fishery near Wraysbury, Phil caught the Twin at 46lb, a 35lb mirror, a 23lb fully scaled and a 19-pounder. “What a session,” said the experienced carper. “The first night there were a few carp jumping out all over the lake and at 6am the following morning I had a 19lb mirror. “I then decided to move swims as I saw a big fish show, and by lunchtime I was set up and had cast out. 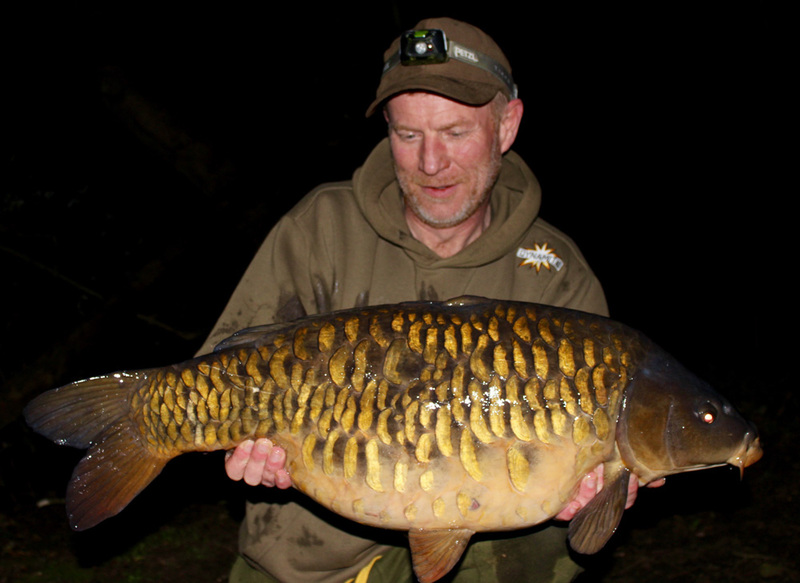 “At 1am the Twin was in my landing net and, at 46lb, it was my first UK 40lb common. All Phil’s fish fell to 15mm trimmed-down pink Dynamite Hit N Run pop-ups over chopped Complex T boilies and pellets soaked in Dynamite Premium Worm Liquid. He used a short hinged stiff rig with a size six VMC Mystic Chod hook.